Kai Stensgaard mødte verdensnavnet Renato Martins, masterpercussionist fra Rio, i 2014 på en stor Internationale Musikfestival i Taiwan. Her opstod idéen til et nyt og spændende internationalt samarbejde, der blander Kai Stensgaards musik og improvisationer med den brasilianske musik. Den brasilianske verdensklasseperkussionist Renato Martins bliver betegnet som udvikler af brasiliansk perkussion i brasilianske slagtøjsmedier. Martins er specialist i udu drum og cajon, men er også en sand mester på loopmaskine; så dygtig at han har vundet europamesterskabet i loop. Det er fascinerende at følge hvordan han herved, lag på lag, kan opbygge de brasilianske rytmer. Loopmaskinen bliver brugt som indslag i koncerten, men det er på udu drum og cajon at de brasilianske rytmer først og fremmest stadfæster sig. Han giver mange masterclasses verden over og er bl.a. sponseret af Latin Percussion og har i den forbindelse optrådt på verdens største musikmesse NAMM i L.A. Han har desuden i flere år spillet med det berømte Cirque de Soleil. Ib Buchholtz er kendt fra mange musikalske sammenhænge over hele landet. Han har gennem mange år været en ledende skikkelse og underviser ved Nordjysk Musikkonservatorium, hvor han har ledet AM uddannelsen. Kai Stensgaard er internationalt kendt marimbaspiller, og som opfinder af 6-kølleteknikken er han en efterspurgt clinician over hele verden. Han er desuden medopfinder af et nyt dansk musikinstrument, aluphonen, som også indgår i hans instrumentarium. Kai Stensgaards egne kompositioner mødes af Renato Martins loopmaskine i en koncert, hvor de to perkussionister spiller både med og mod hinanden, nu også suppleret af Ib Buchholtz legesyge harmonika. Musikken spænder fra det legesyge til det helt dybtfølte. Vores spillestil er et crossover mellem jazz, latin world og klassisk musik – vi kalder stilen Brazilian World Jazz. The Brazilian world-class percussionist and former Cirque du Soleil artist Renato Martins was described as an innovator of Brazilian percussion by Brazil’s specialized Media. Renato Martins has created new techniques to traditional instruments such as the Udu and the Cajon. 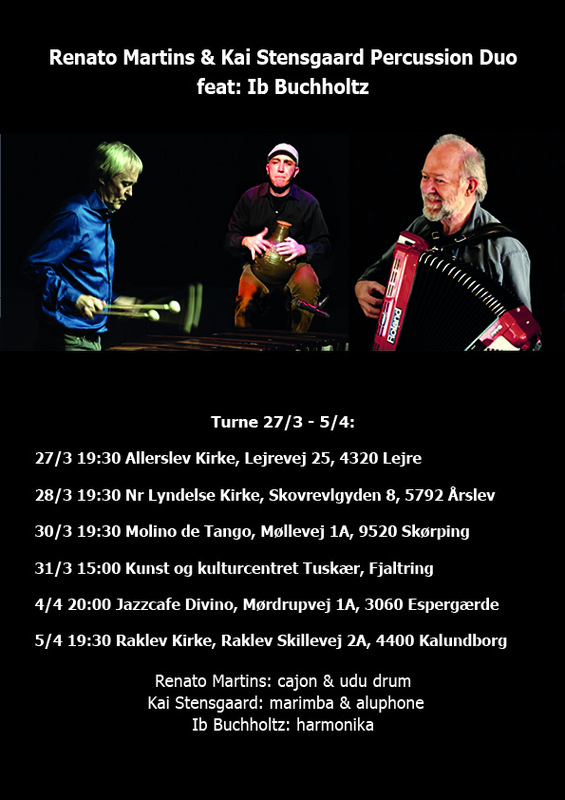 Kai Stensgaard is internationally recognized as a leading concert marimba artist and composer from Denmark. KS is the creator of The Six Mallet Grip and autor of the method with the same title. He has composed several works for six mallets. Many of his compositions and arrangements have been performed by marimba players all over the world. He has been giving concerts worldwide. KS is co-inventor of the Aluphone. Renato Martins comes from a Brazilian traditional music background and turned his attention later into classical piano training. Kai Stensgaard, an originally classically trained musician, decided later to research the origin of marimba playing in Guatemala and Mexico. 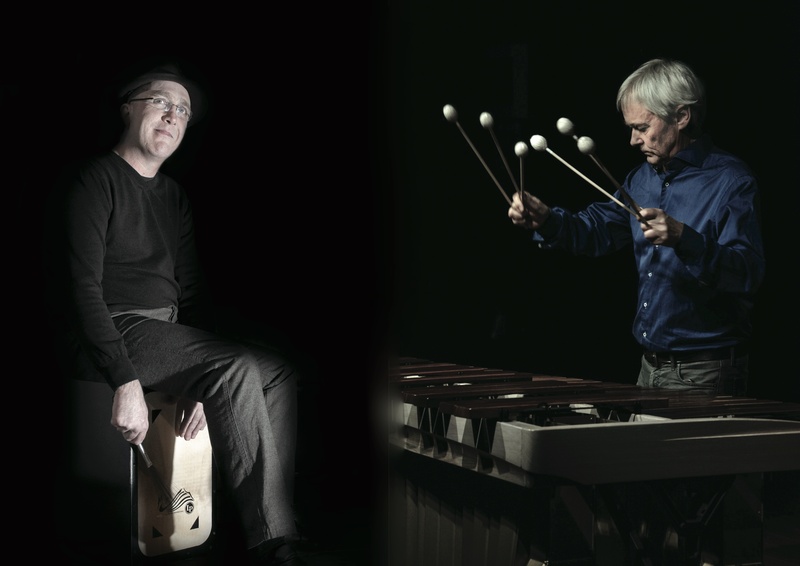 The percussionists, apparently coming from opposite directions, propose with the duo a meeting point questioning the need of labeling in music and celebrating the rhythms and colors of percussion in a powerful encounter. THE SIX MALLET GRIP: how do you hold the mallets, how do you control the mallets, interval changes, excersices and maybe you would like to play one of my six malets pieces for me? I initially started developing this technique back in 1980. The last 40 years I have refined the technique and written works especially for this technique. In 2006, I performed in front of colleagues from around the world with this technique at Pasic 2006 in Austin, Texas, USA. Subsequently I have toured the world and taught master classes on this Six Mallet Grip. In 2009 he published the method textbook The Six Mallet Grip in English and Spanish. FOUR MALLET TECHNIQUE (Stevens Grip): I studied the grip from Leigh Stevens back in 1980. I was the first marimba player in Denmark using this grip and I have a lot of experience in what to do and what not to do. I can get you a Stevens Grip chech up! METHOD OF MOVEMENT BASED ON THE ALEXANDER TECHNIQUE: Some people get problems from playing. It can be problems in the wrist or in the arm. From studying the Alexander Technique and using it myself, I can give you good recommendation on how to stand and move your body when playing. Musical & technical instruction of a piece of your choise: Maybe you want to play a piece for me and I will tell you what I think and maybe come up with suggestions on how to improve the piece for you. Renato Martins is a world class master percussionist and a musical educator. He has performed percussion clinics, master classes and workshops in festivals, cultural centers, music schools and universities in Brazil, Argentine, Qatar, Spain, Czech Republic, Poland, England, Belgium and other countries in Europe. The Creative Percussion Clinic, a mixture of concert and workshop, presents Renato Martins’ unique techniques on his main ethnic percussion instruments, the UDU and the CAJON, nowadays largely used in all music styles. Renato Martins also demonstrates his creative percussion and the results from his research of new techniques and new approaches to creative percussion, such as the use of everyday objects as percussion instruments.